Arcotel ENC-S2xx MPEG-2 SD Encoder series is designed for compression of the real-time video and audio with MPEG-2 codec and transmission of the output signal through both DVB-ASI and GbE TS over IP outputs. 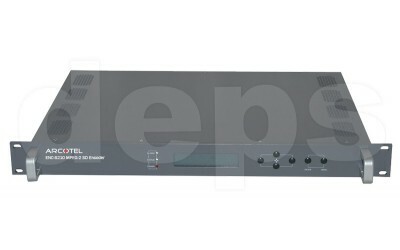 Equipment leverages the latest compression technologies and allows audio and video signal compression with high quality in cost-effective way. Encoder supports compression of one stereo audio signal per each video channel. Arcotel ENC-S2xx is fully compliant with MPEG-2 standard and can be used for content adaptation for compatibility with legacy MPEG-2 SD consumer STBs.